Laureate English is a new kind of learning experience for English language learners (ELLs). Artificial intelligence (AI) technology helps learners improve their speaking skills and helps teachers teach more effectively. Think of it as a kind of teacher’s aide. Learners develop their verbal communication skills through realistic conversations with simulated native English speakers. These simulations are aligned with Common European Framework of Reference (CEFR) can-do statements. Laureate English runs on Alelo’s Enskill cloud-based platform. Enskill’s combination of automated assessment, practice, and personalized feedback helps learners achieve mastery quickly and maintain it over time. Other online language-learning solutions focus on reading and listening skills without giving learners the opportunity to practice their conversational skills, leaving them poorly prepared to communicate in English in college or the workplace. Learners in many countries have few opportunities to practice their English with native speakers. As higher education programs continue to move online, students who struggle with spoken English increasingly risk being left behind. Alelo creates learning solutions that help people acquire new skills and apply them when it counts, changing the way people communicate. 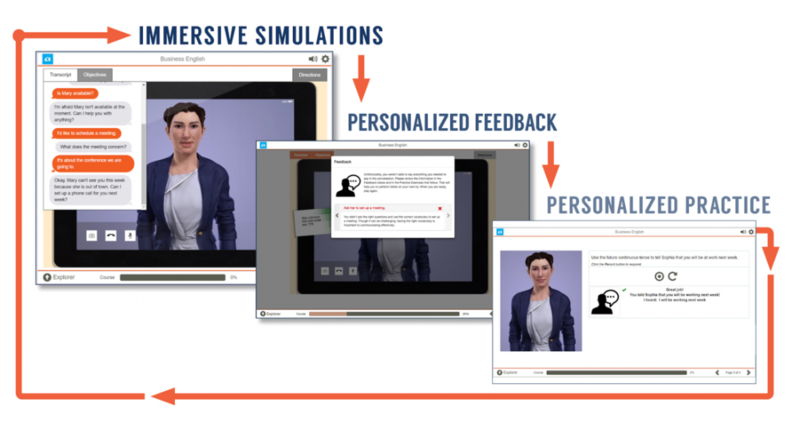 The company has been delivering game-based solutions for learning communication skills using virtual role-play technology since 2003 when it spun out as a DARPA-funded research project from the University of Southern California. Alelo applies its virtual role-play to language and culture learning, and workplace competencies and interpersonal skills. Laureate Education, Inc. is the largest global network of degree-granting higher education institutions, with more than one million students enrolled across more than 70 institutions in 25 countries at campuses and online. Laureate offers high-quality, career-oriented undergraduate, graduate and specialized degree programs in a wide range of academic disciplines including architecture, business, design, education, engineering, health sciences, medicine, law, and hospitality management. Laureate believes society is best served when its students, professors and employees use their collective skills and experiences to create positive and enduring change. This commitment is expressed through the company’s philosophy of being ‘Here for Good’ and is represented by its status as a certified B Corporation® and conversion in 2015 to a U.S. Public Benefit Corporation, a new class of corporation committed to creating a positive impact on society.